Sometimes it’s hard to find your mouse pointer. Maybe you’re getting older like me and sometimes you have little bit of trouble seeing the mouse pointer. Or maybe the color of the background makes it hard to see the mouse pointer. Whatever the reason is, we’re going to give you a tip that will help you find your mouse pointer. We call this our sonar effect tip. No doubt we are the only ones who do, so don’t go to your geeky neighbor and start talking about Windows sonar effects or she’ll think you’re crazy. We call it the sonar effect because of the concentric circles Windows generates to help you find a missing mouse pointer. The sonar effect causes your mouse pointer to pop-up in the center of concentric rings so you can easily find it. In Windows 10 the sonar effect should already be turned on by default. To find out if yours is turned on, press your Ctrl key right now. Did you see the circles appear around your mouse? If you did, you’re all set. If you didn’t you can turn on the “sonar effect” opening Settings > Devices > Mouse > Related Settings > Additional mouse options. 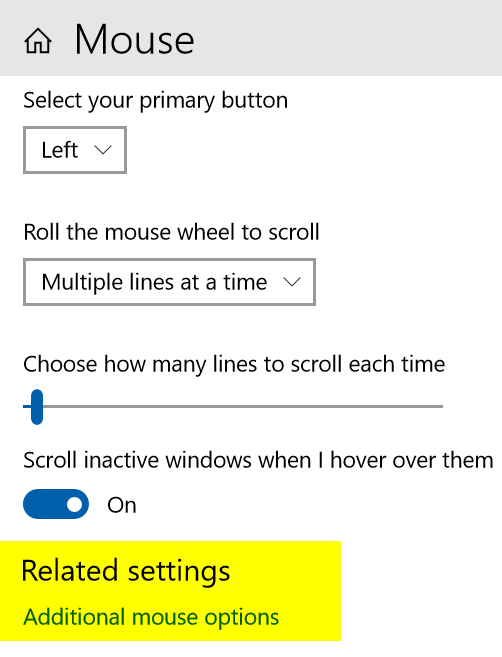 Note: If you open the Windows 10 Settings app full-screen, “Related settings” / “Additional mouse options” will appear on the far right side. 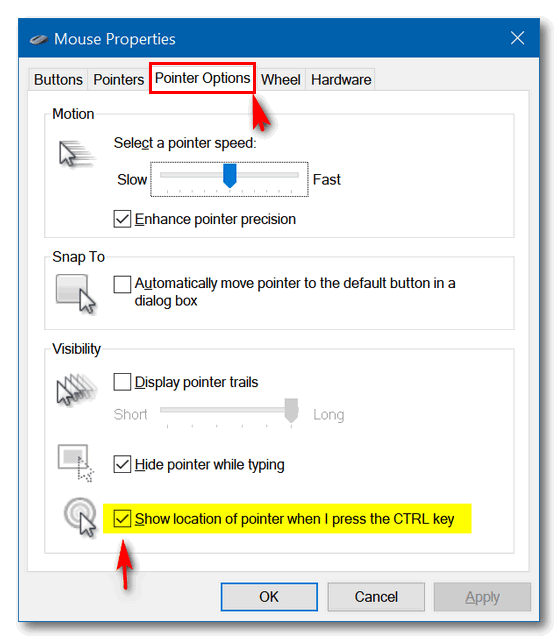 Make sure the box next to “Show location of pointer when I press the CTRL key” is checked. The next time you lose your mouse pointer, just press the CTRL key and Windows will create concentric circles around your pointer to help you find it. Hint: You might have to press the CTRL key a couple of times, the circles don’t stay on the screen long. Another very handy tip ! — I had not realized it was there all the time to help me locate my mouse pointer ! You are also right about the circles not remaining on the screen very long – but a simple press of the ‘CTRL’ button a couple of times finds it for you ! Another big”‘Thank You” !!! David. Hello from Nova Scotia again folks. Yes, I would like to use this tip BUT I can’t find “Settings” > “Devices” etc. Where are these keys on the keyboard listed ??? I know I’m a retarded 87 year old fart, BUT can you help me please ??? Open Settings (right-click on start button) choose “Settings”. When Settings opens, click on “Devices” then click on Mouse then Additional Mouse settings.